This year I am already on it and am done shopping for my kids, husband, and I for Easter! Every year I feel like I am last to grab heirloom outfits and then just give up on my dress. So excited that I’ve already ordered/received my dress, the kids heirlooms, and my husbands shirt! Giving myself a major pat on the back for that one. I am never ahead of the game! A lot of you saw my dress on instastories and asked where it was from. Sadly, it has already sold out and only available in a size 12. I am so upset, because I was so excited to share it with y’all! Crossing my fingers it will be re stocked! I rounded up 12 dresses that I think are just beautiful for moms this Easter! Over half of them are nursing friendly (1, 5, 8, 9, 10, probably 11, and 12) and quite a few can work with a baby bump (5, 6, 8, and 11)! I made sure I kept that in mind when picking favorites. I’ve spent 2 Easters now with a teeny babe who was nursing around the clock- there is nothing worse then not having a dress that isn’t accessible for nursing. So many dresses are already selling out online, but I made sure that ALL of these dresses today had plenty of sizes left. So, if you see anything you like scoop it up asap! 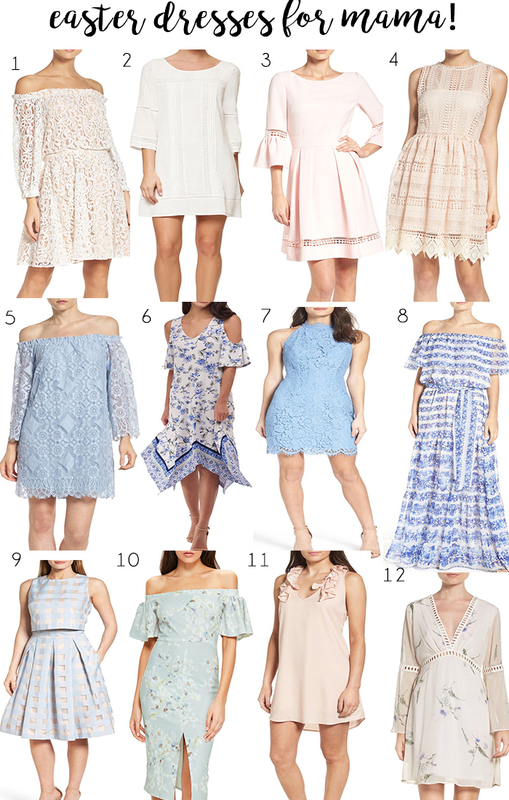 Which one is your favorite easter dress? I always love hearing which ones you all enjoy most! I’ll be sharing kids easter looks & basket ideas in the next week!